DroneX Pro Reviews - Best Choice for Lower-End Drone? The DroneX Pro is a pocket-size drone with an HD camera, auto-takeoff, and auto-land buttons as well as the ability to fold down for easy storage, making it a novel option for a drone. The DroneX Pro is a three-speed drone with a 720p HD camera and a variety of features that make it a highly-rated drone among enthusiasts and tech sites. The drone’s website says some of its more appealing features are that you can fold up the drone when you aren’t using it, that it’s lightweight and that it has a gravity sensor that automatically moves the drone away from possible collisions. The company behind DroneX Pro is called Novads OU and is based in Estonia. Their website is www.hyperstech.com, on which we noticed that the company sells multiple electronic products. For example, they see a portable A/C unit, a USB car charger, a security camera, and a powered wine bottle opener. In this review, we’ll talk about the DroneX Pro works, its features, how much it costs and what customers are saying about it. To operate the DroneX Pro, you’ll power it on and then do a one-button touch in order to get it to take off. From there, you’ll use a two-joystick remote control to guide the craft. The remote control has a special attachment into which you can slide your phone. You’ll use the DroneX Pro app to view the camera footage the drone is taking as it flies. So, in one device you have the ability to steer your drone as well as monitor its camera. Promo videos for the drone indicate that it can perform 360-degree loops simply by pressing a button, which means you can do a horizontal loop, turning the drone upside down for a split-second before it returns to its right-side-up position. There is a pair of buttons on the remote control that provides auto take-off and auto-landing. As we mentioned earlier, the Drone X Pro has a built-in sensor that will override the controls in a situation in which the craft could collide with an object. The craft’s website says it can fly “at a speed of up to 19 meters per second,” which equates to around 42.5 miles an hour. The drone’s camera has a frame-per-second rate of 120. A frame rate of this speed allows you to turn your videos into slow-motion videos while maintaining quality. Finally, the DroneX Pro’s website says you can “fly and film for up to 21 minutes,” which means it can stay airborne that long without having to land it or recharge it. We looked through the DroneX’s fine print and found important information about the item’s return policy and its warranty. Each drone has a 30-day return period that only applies to unopened drones. To start a return, you’ll need to email support@hyperstech.com. You can also call the company 24 hours a day at +44 20-3808-9234. You’ll need to get a returned material authorization number that you’ll write down on the paperwork you send back with your drone. Keep in mind you’ll have to pay return shipping, which will cost at least $10 for U.S. residents since the company is based in Europe. The company provides a three-year warranty for an additional $24. This warranty covers “defects in materials or workmanship” and does not cover damage resulting from misuse, modifications or negligence. When you file a claim, you’ll have to pay to ship the replacement parts. In order to file a claim, you’ll need the invoice number from your original purchase as well as the receipt. Finding reviews of this particular drone model was a bit difficult but we were able to dig up an insightful YouTube review that had comments from users who seemed to be drone enthusiasts. 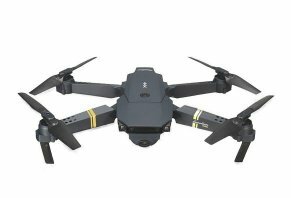 The reviewer, Big5 Adventures and Reviews, noted that he had trouble linking the drone to the controller, that the 360-degree spin button didn’t work and that he’d paid for a 1080p camera resolution upgrade but received a 720p drone. He went on to say that it’s pretty easy to fly the drone both indoors and outdoors. On the negative side, the reviewer said that battery on the drone lasted seven minutes, not the 21 minutes the website says. The reviewer gave the drone a 3 out of 5. He also pointed out something quite interesting: that the drone is similar to other drones sold by third-party companies. We looked into this and discovered “Emolion Drone” visible on the body of the DroneX Pro. We googled this name and found drones all over the internet that look exactly like the DroneX Pro for far cheaper. For example, Walmart sells the exact same drone for $59.99 with free shipping. We went back to the comments section of the YouTube review and discovered that several people also noted the fact that the DroneX Pro is a copy of the Eachine E58, which is a mini copy of the DJI Mavic Pro, a far more expensive drone that is known for its quality workmanship and function. The one drawback of the remote control, which looks exactly like the DroneX Pro, is that the phone holder may press the side buttons on your phone. Because the DroneX PR and the E58 are different products, we can’t guarantee that what applies to one drone applies to the other. However, from the look of the two machines, we believe there may be some overlap in how the crafts fly and operate. At the time of publishing, the E58 was $60.99 at Walmart. Based on our research of this drone, we find it to be a very interesting option. All the markings on it and the name – “Emoilon Drone” are exactly the same as the E58, which means that it could actually be a solid drone in terms of how it flies and the overall quality of the build. This good news for the quality of the DroneX Pro. However, it brings up an interesting choice for you. The drone ships from Europe for $99. What seems to be the exact same drone – the E58 – is available for $60. We believe that the E58 from Eachine offers a better value based on the opinions of drone experts who tested the E58. Regardless of which drone you choose, Patrick Egan, a drone expert and editor at drone publication sUAS News, said to read over the Federal Aviation Administration’s regulations for flying unmanned aerial vehicles. Do not buy from Novads! I ordered the three drones for the price of two, added the 3-year extended warranty, carrying case, camera upgrade and one set of extra propellers. I received the three drones only with no camera upgrade. I've been emailing and sending pictures of what I received to their support email for over a month. They insist the camera upgrade was installed prior to packaging, which is was not. They refuse to send the carrying case, a camera upgrade, and the extra propellers. Don't waste your money on DroneX Pro. The ad says up to 20 minutes of flying time. It gets about 6 to 7 on a charge. Also, it was supposed to come with a nice carrying case. Mine did not. This is really just a basic drone and much smaller than expected. An identical one down to the same stripes can be bought for under 50 bucks. In fact, can be found for as low as 29 USD. It took two weeks to get delivery. After taking it out of the crushed box that was inside a mailing envelope, the drone looked okay. I took pics of the crushed box and sent them to the seller. They said don't worry, it's okay. Very poor packaging. Then looking at the directions I was so confused. I think I need a smartphone to fly this thing. I have sent four emails to ask that question. All I got was an ad to buy one. In some of the instructions, they call this thing a UFO and a flying saucer. I just want to return it. They say mail it to Estonia? It was sent to me from New Jersey. And I have to pay to mail it overseas. I sure would like to get rid of it and get a refund. Write a Review for DroneX Pro!